Joe Oakes was a winner in the Sensa/Drennan Pairs match. The second round of the Sensas/Drennan Pairs event fished remarkably well considering the conditions. Both the Town Welland and the River Glen were carrying extra coloured water and most expected a really poor match. Martyn Freeman won the Barry Mason Winter League match. But to everyone’s surprise fish showed in most sections on the River Glen. There Mark Pollard once again showing he is a class act by topping a very strong field with 16lb 6oz of roach taken on the pole with groundbait and pinkie. Nottingham rod Wayne Swinscoe came second on 9lb 12oz, followed by Mike Kirby with a very respectable 9lb 8oz. The Welland proved a tougher nut to crack. There were fish to be had, and some areas fished really well, but for others it was not the conditions, but a pair of energetic otters that made sure roach were hard to come by. Winner Joe Oakes put the best weight of roach to the scales on the day finishing with 18lb 13oz - most caught on bread punch. Then came March rod Alex Bates with 10lb 9oz, again on punched bread, and Steve Bullbeck with 8lb 11oz. It was a good day for Oakes as he also topped the pairs event with Alan Reynolds. They had a combined weight of 26lb 5oz. At the halfway stage, Pollard and Lee Klymczuk top the leaderboard. The Decoy Over 55s match is one of the most well attended matches at the fishery these days. Come rain or shine the anglers regularly line the banks each Friday. In the most recent match, which was spread over the Cedar and Yew pools, it was those on the former that had by far the pick of the action. Leading the way and continuing his very impressive run of form in these matches was Roy Whincup. He drew Cedar peg five and caught all day on a small maggot feeder for 85lb 1oz. Runner-up was Mike King, who fished a pellet feeder for 60lb 1oz, followed by Stan Dow on 56lb 1oz. Over on the Yew Pool bites were at a premium for most. Ivan Steels put a modest 29lb 14oz to the scales to win from peg 14. All his fish were taken on a straight lead with maggot. Vince Hull came second on the pole with corn putting 19lb 1oz to the scales. Then it was Ivan Kent in third with 18lb 11oz. 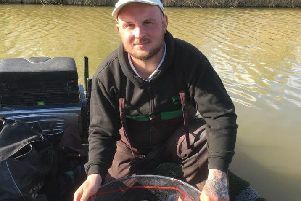 City rod Martyn Freeman made a return to form to win round five of the Barry Mason Winter League on the Beastie Lake at Decoy Lakes. He drew hot peg 24 and caught an impressive 111lb 4oz on a small maggot feeder before switching to a pellet feeder. Charlie Lawrence came second off the next peg with 81lb 5oz, again taken on the feeder, followed by John Whincup with 49lb 8oz. Weights have been below par at Haddon Lodge recently. Out in front in the latest match there with a net of skimmers and a few small carp all taken on punched meat was Mark Quelch, who weighed in 16lb 5oz. Tony Moulds came in second, catching 14lb 6oz on the pole with bread punch, followed by Chris Fuller with 7lb 6oz.